A few weeks into the new term in school, my daughter came home one day in an unpleasant mood. On probing, she burst into an angry tirade about her history lesson – in particular an assignment that the class had been given based on the first lesson they had just completed. This left me a little confused since my daughter had been singing praises about the teacher and the subject in particular till about two days ago! What could have gone wrong, I wondered. Intriguing, because here was a teacher who was trying not to follow the oft talked about textbook culture but clearly the strategy didn’t seem to have gained complete acceptance and appreciation among students and their parents. A glance at the parents’ WhatsApp group confirmed this. Many parents had expressed their displeasure at the ‘out of text’ questions. Some said it was good that the teacher gave the students ‘extra’ information related to the topic but it wasn’t right on her part to frame questions that required them to explore answers elsewhere. Clearly it looked like some parents were still not able to shake off the textbook culture that underscored their school years. On the other hand, I’ve also had experiences with teachers who insisted that my older son should adhere to the textbook for answers in the board exams. I feel these experiences bring to the fore, the fact that despite the increased focus on child-centered methods of teaching, teachers even today lack the autonomy to teach and test in ways they want. Textbooks continue to dominate our curriculum and is the main tool of pedagogy that teachers are expected to teach from and be subservient to. Educationists, policy makers and various other stakeholders in education have often highlighted this aspect of our educational culture. From my experiences as a parent, I feel it is important for schools to include parents in decisions related to systemic changes such as the move away from the textbook culture. Most parents whether in urban or rural settings come from educational backgrounds where textbooks are the mainstay of the syllabus. 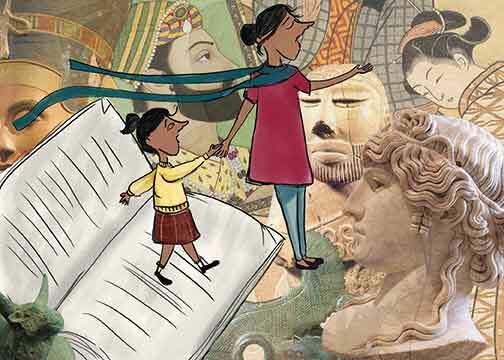 And therefore even though they expect changes in the curriculum and may welcome child-centered pedagogy, for many, textbooks remain the go-to for ‘knowledge’ acquisition. Children of urban parents may have access to more resources due to access to technology; however the yardstick for a good performance in school continues to be how well children ‘know’ their subject textbooks. For a rural parent who may also be a parent of a First Generation Learner (FGL), textbooks by default, are the only sources of knowledge and are seen as a catalyst for changing their socio-economic status. Even so, parents, especially in urban areas, with access to resources such as libraries and technology can guide their children to acquire knowledge outside school in other ways. However, this access is limited for rural parents and parents of FGLs – therefore access to alternate resources of learning within schools becomes imperative. To create this awareness about alternate resources, I believe teachers should have the autonomy to use resources other than textbooks. This aspect, I feel is still not adequately addressed by those who propose systemic changes in our educational culture. In the process of trying to change our educational culture, some questions that come to mind are about how often schools, through the School Management Committees (SMCs) or otherwise, reach out to parents not only about curriculum changes but also about creating awareness of new ways of teaching-learning that do not privilege textbooks? Do schools also address concerns of assessment that such changes imply? From parent talk that I hear or in more recent times the conversations I read on parent groups, I feel schools can do more to inform parents of proposed changes in teaching-learning vis-à-vis policy. There is an assumption that due to access to various sources of information and presence of social media, parents, especially in an urban setting will be aware of the proposed changes in educational policy or new methods of teaching-learning. I think schools should be more proactive in involving parents in discussions related to policy changes and the SMCs, even in private schools, should take on a more active role in disseminating information and generating discussion on proposed changes in policy matters related to education. As someone in the field of education, I know where to find credible information on policy, etc., and to differentiate fact from fiction about proposed changes or the rationale behind new ways of teaching-learning. This may not be the norm for a majority of parents, even those who are ‘educated’. In rural areas and in government schools the role of sharing this information comes under the mandate of the SMCs and even though these committees are seen as more active in government schools, measures should be in place to ensure that discussions on policy changes include all parents across class and caste lines. My concern here has been that systemic changes in our educational culture can only happen when all stakeholders participate equally in the process of change. Given that we have for so long been used to textbooks dominating pedagogy in the Indian classroom – spreading the awareness of this change among parents who predominantly have been the products of this culture is imperative. We have to think of ways to engage parents in this process consistently, making them recognize that giving increased autonomy to teachers is also one of the ways for classrooms and teaching-learning to move away from the hegemony of textbooks. Needless to say this participation of parents in any change in our educational culture should be one that transcends class, caste and socioeconomic distinctions for it to be an effective and long lasting change. The author is a Research Associate at the Centre for Education, Innovation & Action Research at TISS and is currently part of the Connected Learning Initiative (CLIx) project, where she is a curriculum designer for the English language modules. She is a postgraduate in Education from TISS and a Cambridge CELTA certified teacher and teacher trainer. She can be reached at sujata_bhonsale@hotmail.com.